Bob Jemison tucked in at Mount Druitt in 1952 – the new Lambretta's first local appearance. The abbreviated top frame loop can be seen under the fuel tank. Strange looking devices they may have been, but the Lambretta C Racers were effective, if ephemeral in a competition sense. During the Second World War, when Allied troops began the invasion of Rome, British bombers dropped small crates which were recovered by ground forces. Inside the cases were two-wheeled contraptions; Corgis fitted with 98cc Excelsior Spryt engines, which were themselves adapted from the Welbike. The US-made Cushman was another-such machine that came to Italy in large numbers, and many of these remained in the devastated country at the conclusion of hostilities. Like hundreds of other companies, Innocenti, founded in the 1920s by Fernando Innocenti primarily to produce seamless steel tubing, was faced with the massive task of rebuilding and diversifying into whatever industry would turn a profit. Innocenti reckoned that the Corgi concept could be developed into a low-cost vehicle aimed at the working class. The original drawings for a Lambretta scooter were the work of Cesare Pallavicino in 1944, but shortages due to the war meant the concept stayed just that for several years. Prior to the commencement of production, Pallavicino’s project was taken over by Pier Luigi Torre, who completely redesigned the scooter by the end of 1945. Despite shortages of coal, electricity and most other raw materials, production began in 1947 with a target of 150 scooters a day. The name chosen was Lambretta, derived from the Lambro, a small river that ran near the factory. It was tough going, and production staggered along at a fraction of the target, probably less than a dozen completed machines a day. However by the end of 1948, the daily total of the original M Model (M for Moto-scooter) Lambretta had reached 70, and exports began to the US and to Argentina. By 1949, a new model, the B, was in production, and this set the scene for the brand’s success. Although still using the M Model engine and transmission, the B Model incorporated a new trailing-link front suspension, sprung rear end, 8-inch instead of 7-inch wheels, and a gear change operated by a twistgrip instead of a foot change. The B’s rear suspension came in the form of coil spring dampers mounted horizontally under the engine and a knuckle joint with spring suspension at the rear hub. This feature was thought to sap power and was not used on the racing scooters. The front suspension had the rubber bands replaced by a pair of springs in the front forks. Significantly, the B was offered in six different metallic paint colours, whereas the opposition stuck to one or two. It was a marketing ploy that worked. Within a year another new model appeared, the Model C, with a 125cc engine, and this in turn was superseded by the D (1952) and the cheaper E (1953). To promote the brand, Innocenti built a record breaker based on a Model C, which was gradually developed to produce 9.6 kW (13 hp) at 8,800 rpm in ‘supercharged’ form, using a volumetric compressor – more than triple the scooter’s original output. The device used fairly standard front and rear suspension, with a fully triangulated frame made from small-diameter tubing. Special Pirelli 3.00 x 12 inch tyres were fitted and the whole machine was clothed in a streamlined aluminium shell. In early 1949, a four-rider team arrived at the banked Montlhery circuit in France and established a new 24-hour world record, covering 2,467 kilometres at an average speed of 102.8 km/h. 18 months later, Dario Ambrosini (1950 250cc world champion on a Benelli) set new 125cc class records of 132 km/h for six-hour, twelve-hour and 1,000 km marks. Finally, in 1951, Remolo Ferri piloted the Lambretta to an incredible 200.7 km/h for the flying kilometre and 201.8 km/h for the flying mile on the Munich-Ingolstadt Autobahn. Even though the scooter business had yet to turn a significant profit, Innocenti began to seriously consider branching into true motorcycles, and engaged Ing. Salmaggi to design a 250cc V-twin racer – a SOHC four stroke, not a two stroke. Several prototypes were built, the first fitted with torsion bar rear suspension coupled to a large diameter backbone-type frame, and using the 90º transverse twin engine and 5-speed gearbox unit as a stressed member. One school of thought was that this design was produced to scare MV Agusta out of the scooter class – they had produced several special scooter racers for the long distance events of this time. The Lambretta motorcycle was tested at Monza and showed considerable promise, but plans were shelved after an agreement was reached with Moto Guzzi whereby they would stay out of the scooter market provided Lambretta gave up any plans to produce motorcycles. Whether by chance or convenience, the V7 Moto Guzzi that turned around the company’s fortunes nearly 20 years later bore an uncanny resemblance to Salmaggi’s design. But back to scooters. 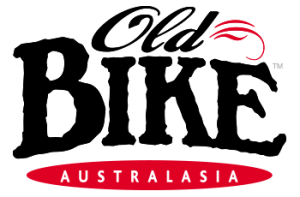 With their eye on export markets, Innocenti sent out feelers in all directions, including Australia. A race-prepared Lambretta scooter found its way to these shores, imported by Bendigo motel owner Jack Walters; this had the A-series motor and transmission housing without the knuckle joint rear hub. It was generally referred to a B-Series racer because of the enclosed front mudguard and general appearance, and was campaigned initially in Victoria by Fane Iles who rode it to third place at Ballarat Airfield in November 1950. Iles was rather unimpressed with the handling of the machine, and after it appeared at the 1950/51 New Year’s meeting at Victoria Park, Ballarat he gave up the ride. Bert Flood took over the reins, and in October 1951 scored a win at the South Australian Jubilee TT at Woodside. Just two weeks before the South Australian event, in a one-off experiment, a Clubmen-only meeting, the Mount Panorama Grand Prix, was staged at Bathurst on September 29, 1951. 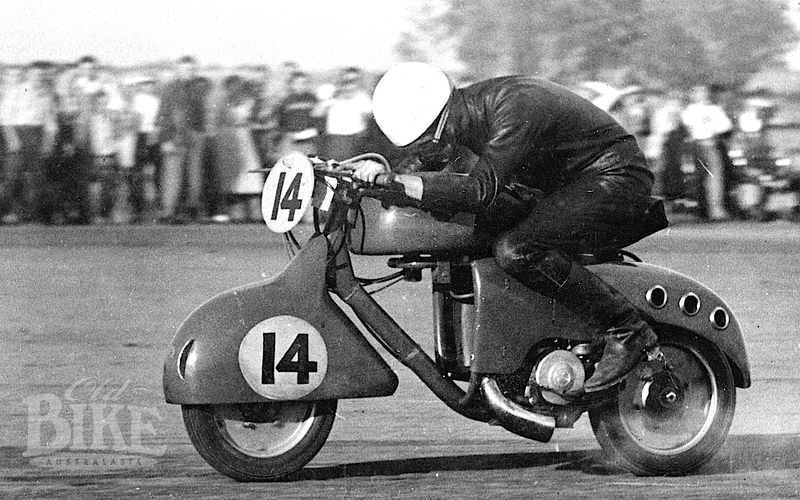 The winner of the 125cc event (the first time Ultra Lightweights had raced at the circuit) was John Seary, who rode a standard-looking C-Series scooter, complete with 8-inch wheels and twist-grip gear change, to an easy win over the Bantam BSAs of Keith Farrell and Keith Davis. Seary was no stranger to scooters, having won the incredibly gruelling 24 Hour Reliability Trial conducted by Auburn MCC in November 1950 on a Lambretta, with another Lambretta filling second place. Only 25% of the field finished the event. 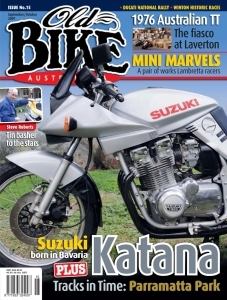 One month later he won another long-distance trial on the same machine; a 180-mile run over varying road surfaces, from tarmac to bush tracks conducted by Canterbury Bankstown MCC. On Anniversary Day, January 29th 1951, Seary took his Lambretta to the track, finishing fourth in class at Castlereagh Airstrip. At Gnoo Blas, Orange in 1953, Sam Jamieson with Keith Conley (3) and Bob Jamieson (19). In Sydney, ‘Big Sam’ Jamieson, through his company Australian National Motors, began importing Lambretta (and other Innocenti products), and to publicise the brand, arranged to bring in two pukka C-Model racers, for the princely sum of £500 each! This would have bought a new Manx Norton at the time (had one been available), but the two machines came with a considerable quantity of spare parts, including four different diff ratios, spare wheels and Mahle pistons, carburettors and exhausts tuned for either petrol or alcohol fuel. Jamieson went the whole hog, fitting out a bright red sign-written double-bike trailer to travel to the races, and engaging the services of quick (and light weight) riders Bob Jemison and Keith Conley. Jemison was actually approached by Sam Jamieson following his heart-breaking ride in the 1950 NSW GP at Bathurst. After leading for most of the race (which was held concurrently with the Junior GP) on the same MOV Velocette that his father Tommy had ridden to victory in 1938 and 1939, Bob had the magneto fail on the last lap. To be offered a ride on a genuine works racer wasn’t something that happened every day, and Jemison was sceptical, but on November 15th, 1951 the Lambrettas duly arrived, and were presented to the media at a special function at the company’s premises in Sydney, attended by the Italian Commercial Attache and the president of the Italian Chamber of Commerce, as well as several top riders and trade representatives. The two Lambrettas differed greatly from the road-going models, having special frames with a large diameter front down tube that swept rearwards at 45º and under the engine, where it met the twin smaller diameter top frame tubes. A fat jelly-bean shaped alloy fuel tank sat atop the dual top tubes, which finished in a loop, short of the steering head. A single shock absorber was attached on the right rear of the transmission tunnel, which housed the shaft drive. The actual rear springing was by a torsion bar located under the engine. Front suspension was by an undamped spring unit mounted on the trailing link forks. Alloy wheels with finned brake drums were fitted with 12-inch Pirelli racing tyres from the special batch made for the European record attempts. The gearbox contained four ratios with a foot change, and theoretically the clutch was only needed to start the machine, whereafter gears could be changed without the clutch. A 28 mm Dell’Orto carburettor fed the mixture. Officially, the Lambrettas, engine numbers 4S and 5S were designated Monotubo (single exhaust), and had been converted from the Bitubo (twin exhaust) racers ridden for the factory by Romolo Ferri and Alfredo Copeta. The single-port iron barrel had a single piston-controlled transfer port, while the crankshaft, con-rod and big end assembly and drive shaft were all made by the Swiss armaments factory, Oerliken. They represented the last of the line as far as factory-built racers went, although some of the later D Models were converted for racing by main Lambretta dealers in Italy. The earlier racers had been designed for success in the long distance events of the day – the Milano-Taranto and Giro d’Italia among them. Accompanying the scooters was an official factory mechanic, Renato Been, or ‘Beenie’ as he became known. Been insisted in running the bikes on a very rich mixture, which ensured easy starting and complete reliability, even at the expense of higher revs and hence, higher top speed. For the 1952 season the Lambrettas performed fairly well, winning several events at Mount Druitt and taking Jemison to second place at Bathurst behind the all-conquering Walsh Bantam ridden by Maurie Quincey, and ahead of the old B Series racer ridden by Bert Flood. John Seary rode the second works machine but was unplaced. 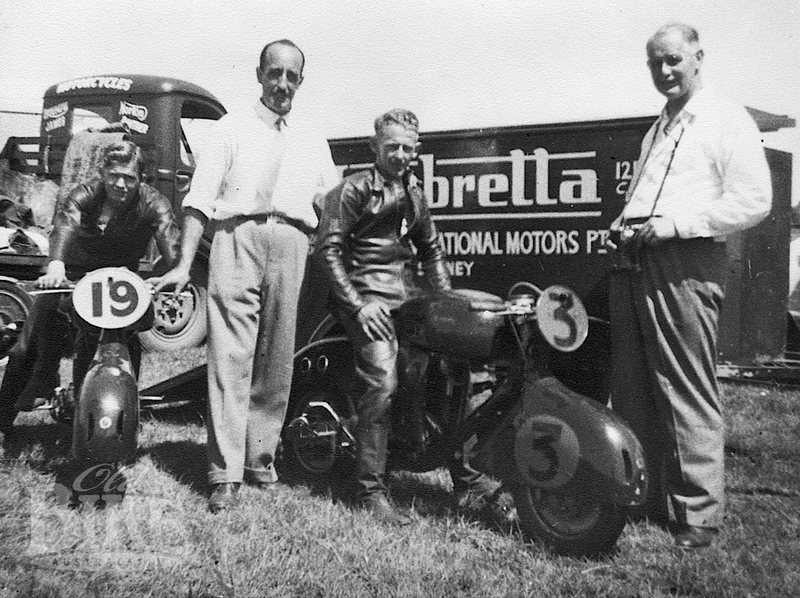 At the end of the 1953 season Bob Jemison retired from racing, and Keith Conley moved on to bigger machines, so Sam Jamieson offered the Lambrettas to the Hinton brothers, Eric and Harry Jnr. On alcohol, the engines were operating on 9:1 compression, but the Hintons progressively raised this to around 15:1, although with a dramatic drop in reliability – melted pistons were not uncommon. However when the engines stayed together they were fast – top revs increasing to over 8,000 which equated to 115 mph (185 km/h) on the tallest gearing. Eric Hinton was especially critical of the gearbox, describing it as “having about forty neutrals and four forward gears”. The Hintons persevered with the Lambrettas for little more than twelve months before handing them back to Jamieson, and nothing was seen of them for several years. Eventually the Lambretta agency, and the two racers, passed to Hazell & Moore in Campbell Street, Sydney. The racers were consigned to a corner of Hazell & Moore’s workshops in Surry Hills, and were basically forgotten. 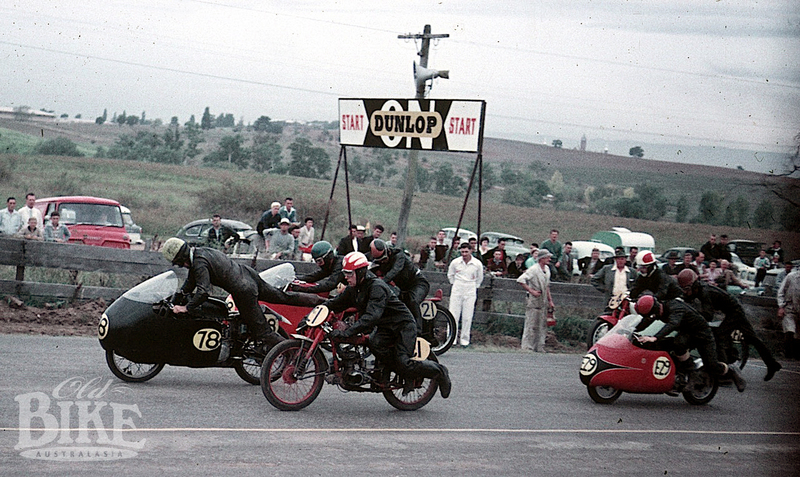 Start of the 125cc TT at Bathurst in 1959. Dale Booth is on the Lambretta (E29). Others in the picture include George Huse (Hunter Picaninny, 78), Frank Primmer (BSA, C1), Roy East (MV, 18), C. Berendes (CZ, 21), A. Furze (Gilera, E4), and winner Noel Gardiner (Walsh Bantam, E12). Around 1956, Kevin Roydon, who had a large motorcycle business at Lakemba in western Sydney, bought both Lambrettas. They were rebuilt with help from the redoubtable ‘Nooge’ Smith, who made aluminium fairings and a smaller fuel tank for the 4S bike, which hung through the top frame rails. Both bikes had extra tubing attached to the top frame rails, connecting the steering head to the loop under the fuel tank. Dirt track rider Vince Tierney (who worked for Roydon at the time) and Jack Haynes (who weighed 12 stone – 77 kg, surely a handicap for these tiny machines) appeared at Bathurst in 1957 with the pair, and George Colley took over Tierney’s machine the following year. In 1959, the riders were Dale Booth and Tierney. The standout result achieved in this period was Kel Carruthers’ second place in the 125 cc Australia TT at Phillip Island in December 1957. Roydon eventually disposed of the pair to Haynes and his pal Lionel Gillet, and the 4S machines soon passed to Dale Booth, who then acquired 5S and sold 4S to Geoff Burgess. Around 1960, Ron Black and his mate Ron Bastick made an offer of forty pounds for one of the bikes which was accepted, and Black raced it at Orange and at Bathurst in 1960, 61 and 62, although with no real success. In fact, it failed to make the start at Bathurst in 1962 after the clutch packed up in practice. The machine was subsequently sold to Barry Robbins, who entered it for Bathurst in 1964. 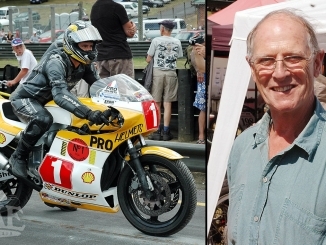 Dale Booth raced 5S at Bathurst and at the Victorian Darley circuit, before selling the bike to his cousin John Bauskis who took it to Victoria, where it remains. The tired old scooter ended up at a wreckers yard at Seaford, where noted Historic racer Doug Fraser took a shine to it and owned it until the mid-70s. It is now owned by a stalwart of the Victorian classic scene, Garth Rhodes. As for Lambretta itself, a combination of the labour strife that crippled Italy in the 1960s, and bad management finally brought the Innocenti company to its knees in 1972. The motor car side was sold to British Leyland, while the scooter business and the Milan factory was acquired by the Indian government. Scooters India Ltd began producing Innocenti’s final design, the GP 150, but production ceased altogether in 1998. Nowadays, vintage scooters are highly collectable, and none more so than this pair of rare mini racers. Story by Jim Scaysbrook with valued assistance from Peter Shannon, and Doug Fraser. Photos from Peter Shannon, Keith Conley, Leigh Ward, Keith Ward.